Meet Lawrence Hubbard of “Real Deal Comix” : COMICS ARE EVERYWHERE! 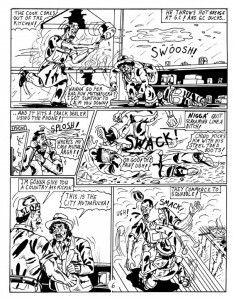 The black-and-white drawings of "Real Deal Comix" burst forth on the page in a supernova of irreverent humor and gritty violence that runs against the grain of politically correct American mores. On Saturday, July 28, 2012, JJ Villard introduced me to comic creator Lawrence Hubbard (aka Rawdog), best known for the gritty, violent and streetwise mayhem of Real Deal Comix that revels in explosive depictions LA’s seamy underworld. JJ and Lawrence are collaborating on an animated piece based on the edgy and irreverent spirit of this indie comic with a cult following stretching back to the late 1980s. I filmed a scene where JJ shows footage of the animation-in-progress to Lawrence and provokes an enthusiastic reaction from his favorite comic-book artist. In the near future, I look forward to seeing these like-minded artists bring their collaborative project to fruition as part of the wildly unpredictable narrative of Comics Are Everywhere. Here’s a vintage interview with Lawrence discussing the anything-goes universe of street attitude and trigger-happy, urban violence running amok that is Real Deal Comix. Watch out!